Help us divert electronics from landfills. Free Geek was founded in Portland, Oregon in 2000, when one man started collecting cast off computers in the corner of his dining room. To promote social and economic justice, focusing on marginalized populations in the Greater Toronto. To make our city a place where e-waste is disposed of responsibly, safely and ethically, and where everyone has access to computers and the Internet. 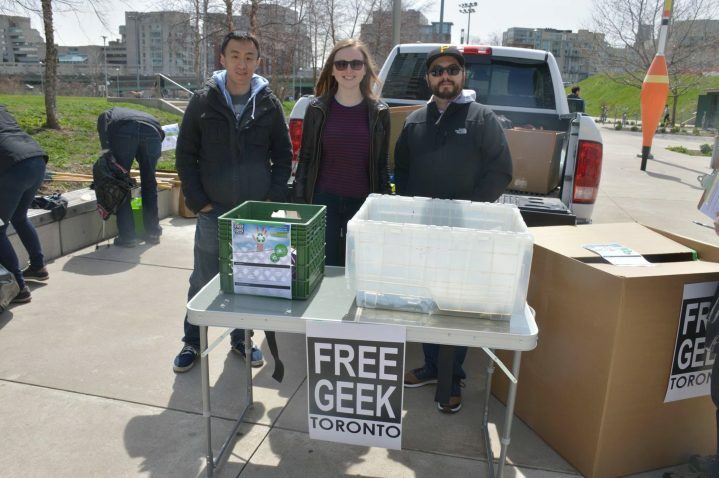 Free Geek Toronto is social enterprise that provides opportunities for people to work and volunteer in a supportive environment. As a registered OES service provider, we make sure your unwanted electronics, or e-waste, gets managed to the highest environmental standards. Our high-quality refurbished computers come with a 30-day hardware warranty to ensure that you’re satisfied with your purchase. Our goal is to make Toronto a place where e-waste is disposed of responsibly, safely and ethically, and where everyone has access to computers and the Internet.